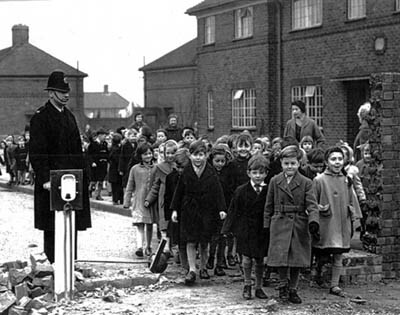 In December 1934 a private developer built two nine-foot high brick walls across the roads that linked ‘his’ estate in North Oxford to a council estate next door : they remained in place until 1959 and they tell a bitter tale of class antagonism in mid-twentieth century England. In the early 1930s Oxford was booming, and changing from being just a university town to a motor-industry town as well. There was an urgent need for new houses, especially as old condemned ‘slums’ were being cleared at the same time. 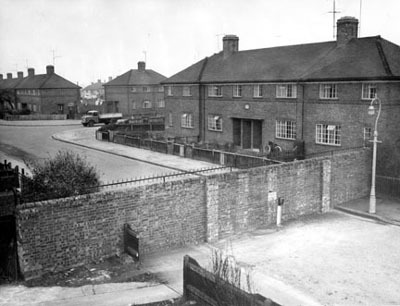 A prime piece of building land was in Cutteslowe, two miles from the city centre up the Banbury Road ; and in 1933 the local Council built an estate there. The next year a 20 acre plot right next door was snapped up by a private developer, the Urban Housing Company. 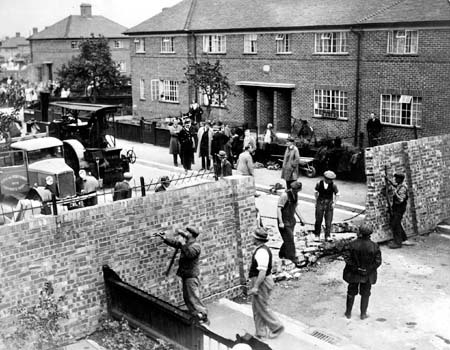 Its owner decided that his houses would be more valuable if they were physically separated from the workers next door, so he constructed two impassable brick walls across the roads that the council estate tenants used to get to the buses and the shops. Almost everyone in Oxford thought this was obviously illegal and that the walls would soon be demolished. They stayed in place for 25 years. This is a fascinating story of the Council’s failure to bring them down – they tried persuasion, threat, legal action, even a Bill in Parliament ; on one occasion they simply removed the walls, but the company rebuilt them immediately. It’s a story of the Communist Party’s attempt to appropriate the issue. It’s a story of undergraduates trying to remove the walls at the dead of night, of drunken motorists driving into them, and of tanks on manoeuvre flattening them during the war. But above all it’s a story of class antagonism and mistrust, and of the failure of public authorities to protect its community against the interests of private developers. I feel that there are still quite a few Posh Oxonians who would like to see the Walls rebuilt and even extended to other parts of Oxford to exclude the hard-working normal people of this world!! During WWII a Canadian Tank Division stationed in Kiddlington [?] on discovering the Cutteslowe Walls were so outraged [ because they were in the UK to fight the Nazis in Europe only to find out that Nazis were freely practising their doctrine of discrimination etc in Oxford] smashed down the Walls with a Sherman Tank! !……of course the Walls were rebuilt in a day or so..!!! You are currently reading Cutteslowe Walls at nevillerae.